Africa in general and Sub-Saharan Africa in particular has seen the perception of the continent swing first from pessimism to optimism and even further to enthusiasm. When visiting Lusaka, Lilongwe, Dar es Salaam and Abidjan one cannot help but notice the emerging African middle class and, on the surface, a sense of optimism. 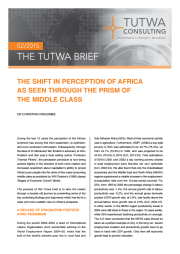 This brief attempts to capture the still on-going debate as to whether Africa’s middle class truly is rising or not and the various perspectives surrounding this debate.